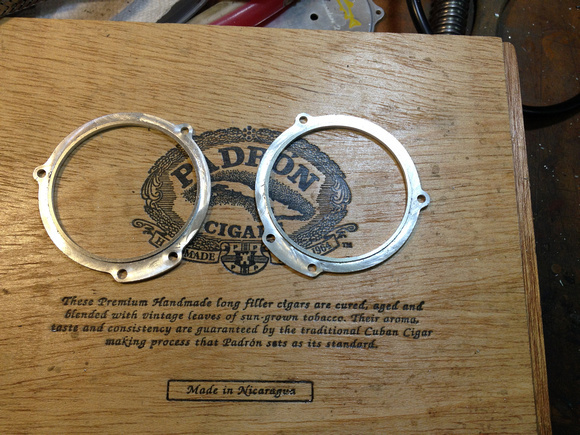 I ran across a great suggestion for making keyed fixtures by Ray Livingston over on the CNCZone. Many of you will be familiar with the idea of keying a vise, where a key is installed on the vise base so you can place it on the table in the same way each time and it’ll be trammed and ready to go. 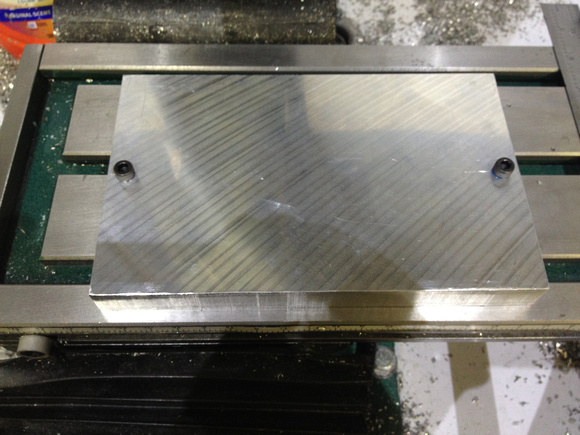 This is a suggestion for doing super simple keying of arbitrary plate fixtures for milling. Ray makes his fixtures on aluminum plate and just installs a couple of socket head cap screws on the underside to act as keys that locate the fixture against the table’s T-slot. Nothing about the bolts needs to be accurate because the emphasis is on repeatability. Even there, the fixture makes use of a probe or edgefinder to locate its precise position. One more important detail: as soon as the keys are in place and the fixture plate is flipped, a finish pass is made along the left and bottom edges. 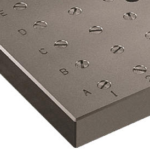 Those edges can now be probed or located with an edgefinder to identify part zero–the lower left corner of the fixture. With a probe and the right programming, this can be done very quickly and automatically. 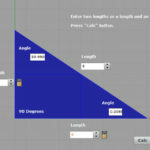 You could even choose to use the two edges to remove any twist because the T-slots aren’t exactly aligned with the axes. Just measure how far out they are from horizontal and vertical and do a coordinate rotation on the program before running. 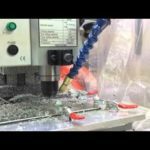 What’s neat about the idea is it is super simple to do and results in fixtures that can be put into action on the machine very quickly. Michael reports he’s made a couple hundred parts with his and will shortly deployed a much larger fixtures that handles parts 12-up instead of 2-up. Bob, this was a pleasant surprise! I have to say I am very pleased with the reproducibility and accuracy of this technique. Since the fixture is indicated in before each session, I am confident my parts will be good. For most of my parts, a high level of precision/accuracy is not required since the parts are machined in a single series of operations. 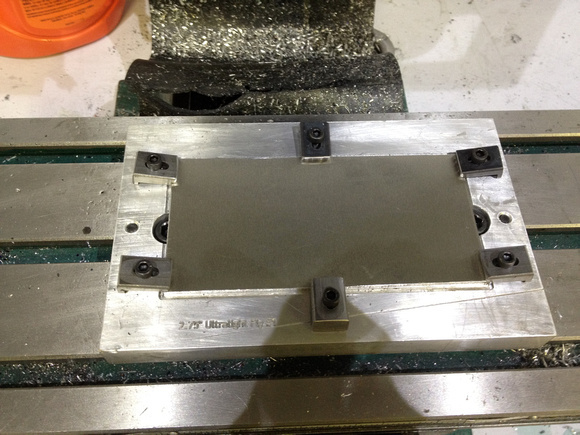 But, I have one part that needs to be machined on both sides. This is where this sort of locatable fixture shines. 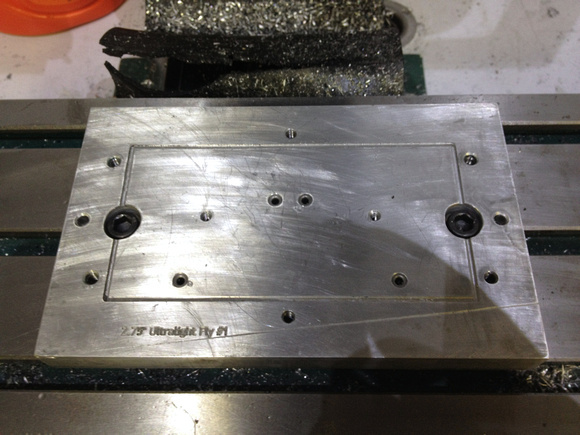 I can confidently flip and locate the part (using .125 dowel pins on this fixture) to machine the frontside. Fly fishing reels require a reasonable amount of precision and being able to make these parts on my G0704 saves me a lot of time. My next version will have a dedicated fixture for the front-side (flipped) operation. I’ll eliminate the dowel pins (they are a bit time consuming) by milling islands to locate the pockets milled on the back side. This will save a lot of time and allow me to mill pockets into a batch of stock first (no tool changes needed so I can fly through that) and then use the 2nd fixture with the islands to finish the frontside operations. I thought seriously about pinning my table and using traditional round and diamond pins to locate. Then Ray mentioned this idea so I tried it since it was very quick to do. I have complete flexibility on where to position the fixtures on my table and for small fixtures like this I can even place 2 or 3 on the table at once. Just a couple of comments, certainly not criticisms. That is an excellent quick idea; and very easy to do. I have been a devotee of ground dowel pins since the 1960’s. They are cheap, hard, precise, and have so many everyday uses in the shop. 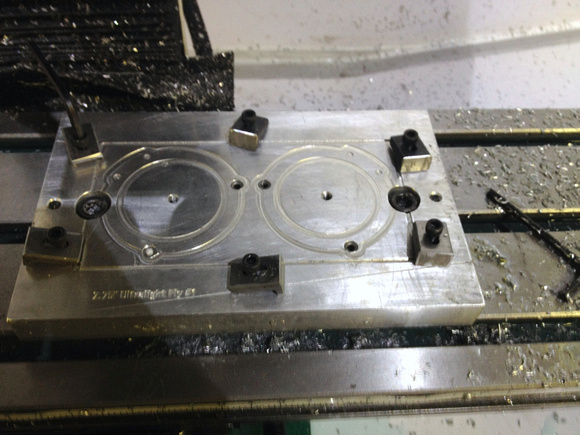 They are great in this sort of work, and it is easy to just drill the holes, if careful. EG if using 1/4″ open the hole in several stagesSay using a stub length dril to stop wandering maybe 3/16 or a tad over. Then a letter B, keeping the speeds moderate,and a lubricant. Then I have a new Cleveland 1/4 inch standard twist drill which is kept for this task, and only a few hundred RPM and oil drill at slow feed rate, and you can literally, tap fit the dowel, or loctite fit it. Also you only need three dowels to positively locate any job; two along the back edge, say, and one set down a little on the Y axis. 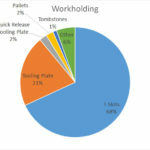 It is incredible how useful these sacrificial toling plates are. 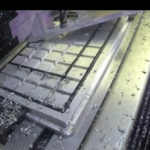 Aluminium is a great choice, and I have had them where I have run thousands of parts over thr years, and there has been no evidence of surface wear, and once the outline has been deliberately milled a little way into the plate, you always have clearance for the end cutting edges, and the job comes off with very little deburring needed. 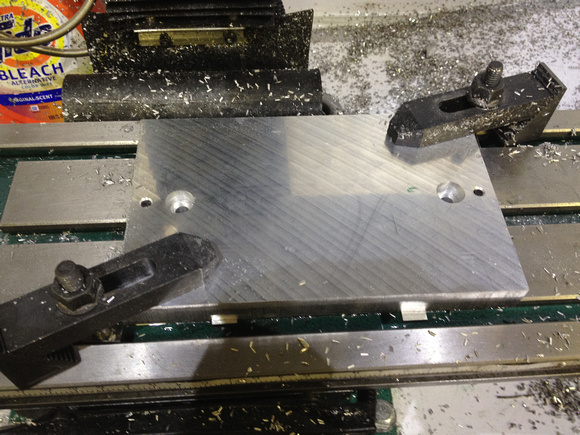 I certainly agree with milling say the front edge of the plate after referencing to the locating dowels, which eliminates any worries of precision of dowel locations in tee slots. It helps to measure the milled datum edge to the locating dowels and stamp ther figure on the plate. Or just keep a few pieces of that wondrous miracle product, ground stock handy to use with an offset spindle center finder device. Used properly, they can pick up one to two tenths of a thou! and do it repeatedly. 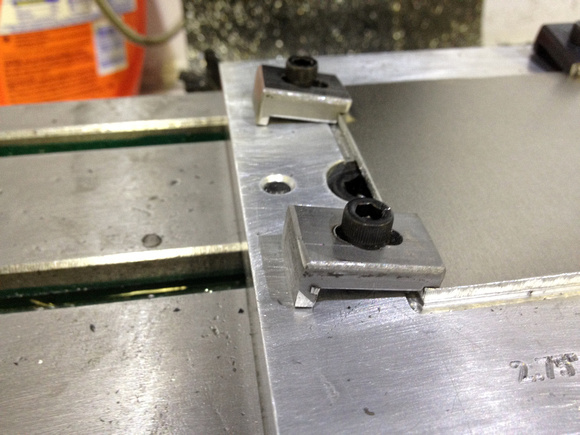 When it comes to those step clamps, the back leg is far too long, the ideal is just a tad higher than the workpiece. I have used longer flat straps for years, ythe rear end being a hex capscrew with a locknut on the top side, just set for length and nip the lock nut . Remember that the stud needs to be as close to the actual clamping point as possible. (the laws of leverage!) 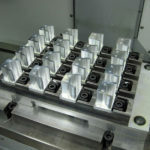 Another useful thing is to use those handy spherical clamping washers so that the clamp nut or cap screw is evenly loaded and has clamping pressure all around the head, and square to the machine table. Another useful little trick to increase the frictional load is to put a piece of newspaper between the mill table and the workpiece., It really increases the resistanmce to shift the workpiece. I liked those specific clamps for your machine vices, very elegant. and aids ion setup time, while freeing up in some cases the clamp set, for holding other things.